Should Congress authorize drilling for oil in the Arctic National Wildlife Refuge in Alaska? Engineering a route for Alaska's proposed natural gas pipeline is no easy task, particularly when it will run through the most earthquake-prone region in North America. 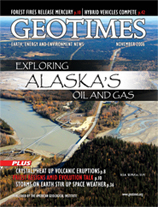 Northern Alaska’s unique geology has made it a leader in U.S. petroleum production for the past 30 years, but its remaining time at the top might be short. Alaskan natives are struggling to improve their economies through mining, while maintaining a traditional subsistence lifestyle. Understanding how bacteria that live underground emit electrical signals is fueling a new field of study that could apply to everything from enhancing bioremediation to looking for life on Mars. Some students are thinking ahead, developing the automotive technologies of the future. Guarding Against Tsunamis: What Does It Mean To Be Ready? Technical systems to warn residents of an impeding tsunami are not enough. The route to the energy sector and politics came unexpectedly to one geoscientist. Is packing the trunk of your car for a roadtrip a personal specialty? Then you might be a geoscientist, or at least think like one. An aerial view shows the Trans-Alaska Pipeline System and Richardson Highway, where they cross the Tanana River at its confluence with the Delta River, about 13 kilometers north of Delta Junction in Alaska. 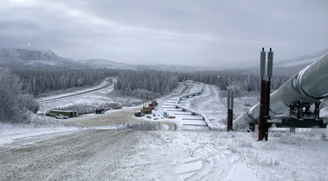 South of the Tanana River, the pipeline is buried where it crosses farmland in glacial outwash deposits. In two current proposals for a natural gas pipeline from the North Slope, the gas pipeline would follow the oil pipeline to this area and then turn southeast to follow the Alaska Highway to a hub in Canada. In a third proposal, the gas pipeline would follow the oil pipeline for its entire route from Prudhoe Bay to Valdez. Read more in this issue. Photo by Rod Combellick.